This IBM Redbooks publication covers problem determination and troubleshooting on the IBM eServer pSeries and RS/6000 platform. It is intended as a guide to the approach that should be adopted when attempting to resolve a problem on the IBM eServer pSeries and RS/6000 system running AIX 5L Version 5.1. It should be considered a useful supplement to guide you through the problem determination process. A problem can manifest itself in many ways, and very often the root cause of the problem is not obvious. This book describes an approach to problem determination that will guide you through the initial steps in problem diagnosis and to narrow down and identify the component or subsystem that is experiencing a problem. 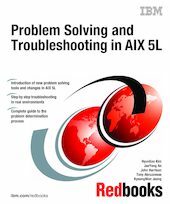 In addition to helping you determine the likely cause of your problem, this book describes some of the most common problems that can occur with AIX systems and, where possible, describes the actions you can take to resolve them. This book is a valuable tool for system administrators and other technical support personnel who deal with IBM eServer pSeries, RS/6000, and AIX problems.